Warm and welcoming, this home was built by Julia Morgan in 1917 for two women doctors. It envelopes its visitors in redwood: the trim, the bookcases, across the mantle of the fireplace, all the way up to the peak of the cathedral ceiling is gorgeous redwood. Unbroken views from Richmond, Mount Tamalpais, the Golden Gate, San Francisco and the South Bay provide a visual feast. On the main level is the Great Room with wooden beams and cathedral ceiling, inviting fireplace, and fabulous views. One wall of bookshelves; a wall of many windows bathe this remarkable room with light. Small but wonderful office; charming powder room. Updated kitchen with skylights, stainless steel appliances. Access to the garage. On the lower level are four bedrooms and a “plus” room. Two updated bathrooms with custom tile work, custom sinks. 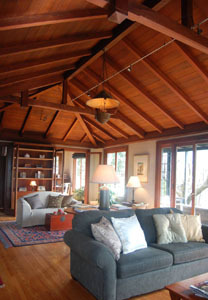 Main bedroom includes sitting area with redwood bookshelves. Front bedroom has those amazing views and a second fireplace. Middle bedroom is charming as is, or perhaps to blend with the front room for a true master suite. Fourth room overlooks gorgeous live oak tree and the garden, as well as the Bay. This home was listed in March 2009. We heard four lovely offers and the property sold for $150K over list price!